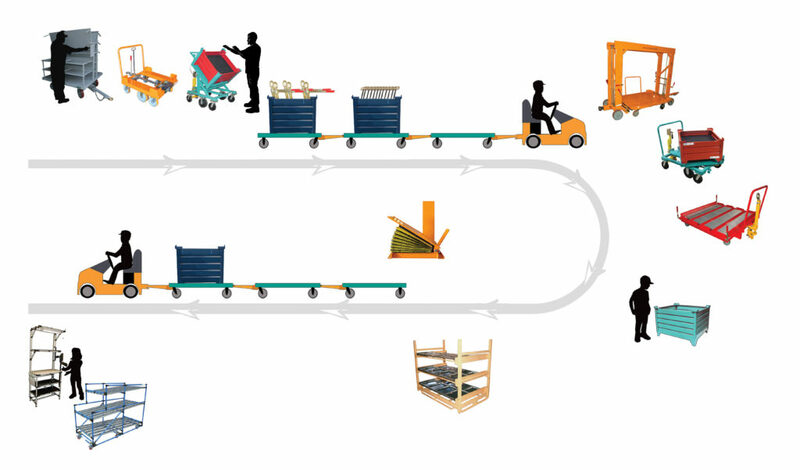 Fork truck free programs can contribute value in areas related to the reduction of inventory, improvement of material flow, reduction of line-side handling equipment and floor space, improved operator ergonomics, cycle efficiency and the reduced need for coordination between forklifts and operators for replenishment of stock. American Machinist looked at plant operations noting that tugger pulled carts require a careful examination of the physical plant, assembly line and storage constraints, packaging changes, budget limits, and ergonomic issues. Top management and the affected departments and suppliers must share ownership of the fork truck free plan. Working through the details of fork truck free changes in existing plants (Brownfield) is different than in new or remodeled facilities (Greenfield) where constraints can be adjusted on the drawing board. Brownfield forklift free conversions work best when done incrementally by addressing one to two work cells at a time or common assembly areas. A good place to start planning is in an area where a Kaizen event or new product or process is being implemented and the material flow process can be changed at the same time. Brownfield conversions yield good results when the material flow of cart delivery via tugger frees up warehouse and plant floor space. With strong growth and sales, there is often an assumption that more space is needed. When examining a lean process, the ability to maximize efficient use of factory space negates the necessity of additional square footage. With distribution center and manufacturing plant space is in high demand (vacancy of available space in 2018 is predicted to be less than 5 percent throughout North America). According to Inbound Logistics, tugger pulled industrial carts are well-suited for lean manufacturing environments, such Topper Industrial customers Anderson Windows, Detroit Diesel, Honda, Kia Motors, Ford, Chrysler, Aramark, Johnson Controls, Whirlpool, and Caterpillar. The idea behind forklift-free is replenishing material as it is used, rather than keeping excess material on the production floor. The cart operators bring parts up to the floor only when they are needed, meaning no excess inventory is stacked in aisles. With more manufacturers and distribution centers demanding smaller product quantities, split case picking is at a very high level never even considered just two years ago. The use of carts pulled by AGV (Automated Guided Vehicles) tuggers is great for applications such as split case picking and direct-to-consumer picking. 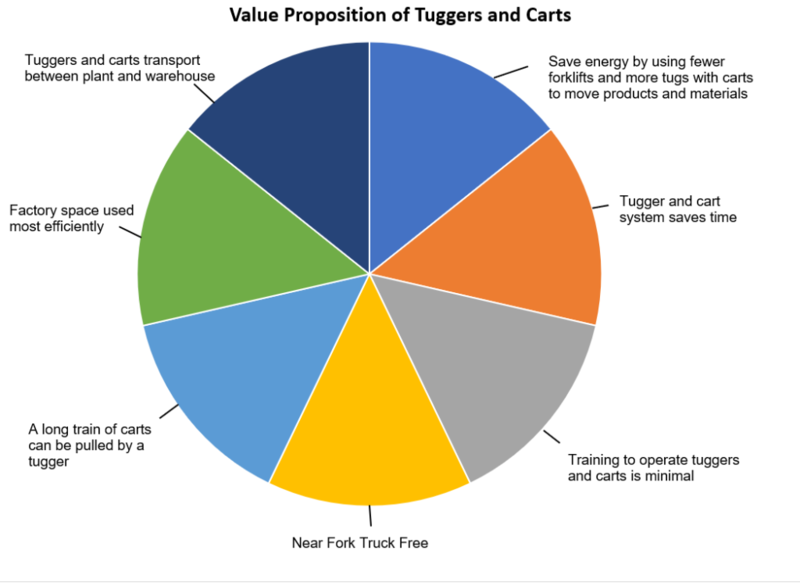 Measuring the current space used for storage and “dead manufacturing cells” can quickly quantify the value proposition of the tugger pulled cart, fork truck free model.